Over 18 million people live within five-hundred miles of the Tri-Cities, spending over $176 billion on retail merchandise. As a result, business leaders and logistics providers choose the Tri-Cities as the ideal location for accessing the Pacific Northwest and all western states and western Canada. Logistics companies thrive here because they are close to customers, have highly skilled workers, enjoy inexpensive power and affordable land and operate in a predictable regulatory environment. Industries in the Tri-Cities send products across the U.S. Companies like Railex manage expedited coast-to-coast refrigerated rail freight service. Trucking companies and airlines deliver frozen foods, raw agricultural products and finished goods throughout the nation. As a major international trade center, the Tri-Cities supplies over 100 countries on all seven continents. Last year, total exports in merchandise from Washington totaled $90.5 billion. Tri-Cities industries were major contributors in 17% of those exports, valued at $15 billion. Logistics services are critical to trade with the BRIC and ASEAN countries, Japan, South Korea, Mexico, and South America; all huge markets for unique consumer goods and products. 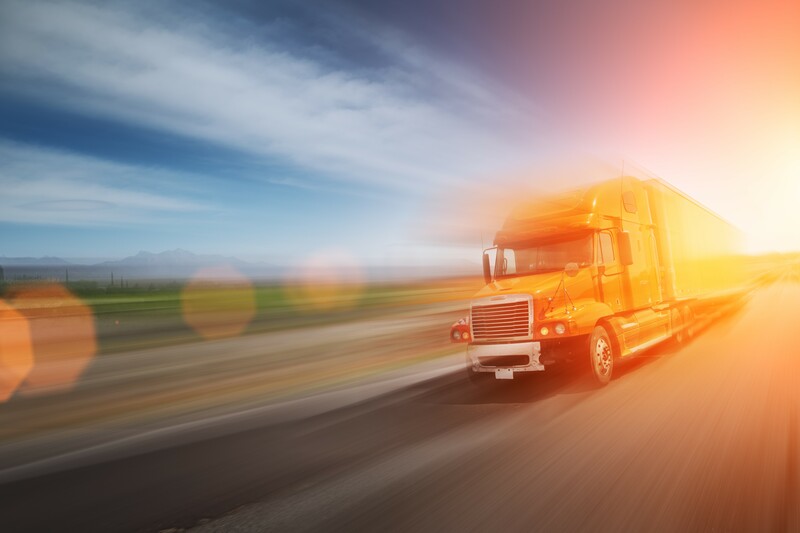 The unmatched transportation network in the Tri-Cities and the Columbia Basin are critical supply chain assets for serving international locations. See why the Tri-Cities is Faster, Bolder and Brighter! 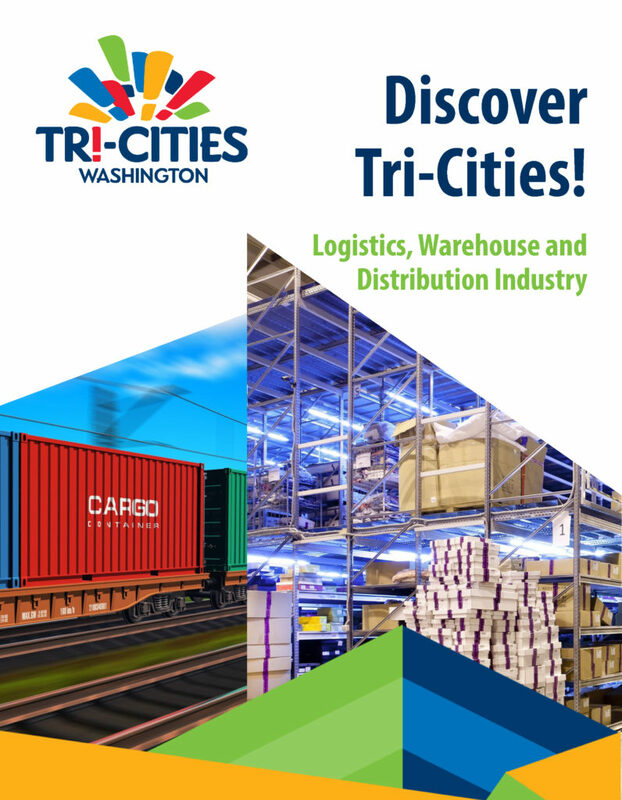 Tri-Cities, Washington – The Ideal location for Logistics, Warehouse and Distribution facilities. The Tri-Cities anchors the region’s economy in technology, production agriculture, food processing, metal fabrication and specialty manufacturing. Successful businesses include AmeriTrellis, Lampson International, AgriNorthwest, ConAgra Foods, Sandvik, TiLite, and Bechtel Corporation, among many others. While existing companies contribute to a robust business environment, new businesses will prosper here. The region is an especially attractive and profitable location for successful, growing companies looking to expand operations and develop new facilities. PNNL facilities, equipment, and world-renowned scientists are developing new technologies in logistics, biofuels and fuel efficiency. The Tri-Cities is a transportation center providing unmatched access to interstate highways, service by two national mainline railroads, commercial barge transportation, and air service from four domestic airlines. The state’s deep-water ports and proximity to important Asian markets are important advantages for agricultural trade. 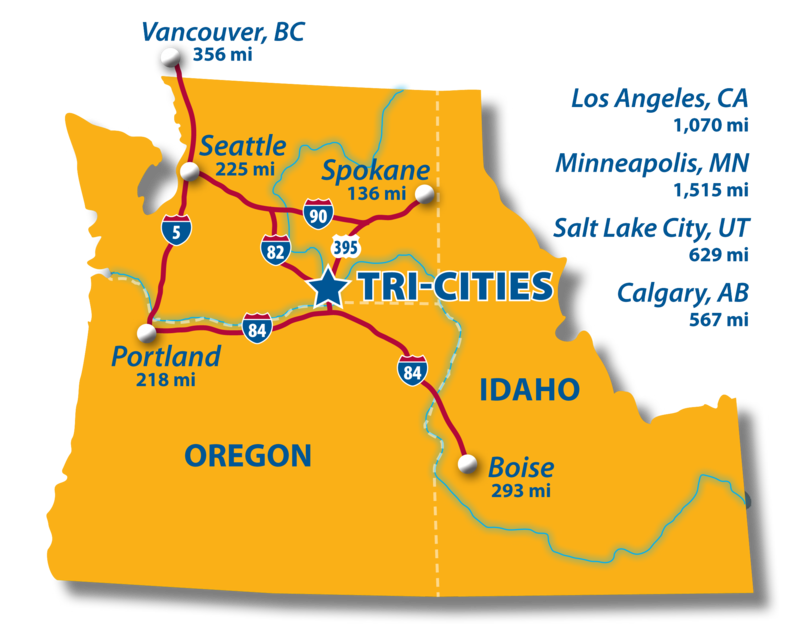 The Tri-Cities is centrally located and linked to the major population centers of the Pacific Northwest, Northern California and Western Canada. The economy of the Tri-Cities is supported by a strong rail infrastructure providing businesses, ports and farms with competitive access to North American and international markets. Mainline rail freight service is provided by both the Burlington Northern Santa Fe (BNSF) and Union Pacific (UP) Railroads. Direct access and dual service from these Class I national carriers is very unique. The Tri-Cities Airport, owned and operated by the Port of Pasco, ranks fourth in passenger boarding among Washington airports. It is served by Alaska Airlines/Horizon Air, Allegiant Air, Delta Connection/SkyWest, and United Express/SkyWest. Direct daily flights serve San Francisco, CA; Denver, CO; Minneapolis, MN; Portland, OR; Salt Lake City, UT; and Seattle, WA. Less than daily service is available to Mesa/Phoenix, AZ; Los Angeles, CA; and Las Vegas, NV. Statewide retail and wholesale distribution. Transportation sustains hundreds of thousands of jobs; and delivers the necessities of life to every resident of the region every day. The Tri-Cities anchors the region’s economy in transportation, agribusiness, food processing, manufacturing, government, and healthcare. Largest wholesale distributor of plumbing supplies in the U.S.
Refrigerated rail service and third-party logistics for temperature sensitive cargo. Largest public refrigerated warehouse company. Grocer and perishables distribution center. Third-party logistics company serving the unique needs of the wine industry. Temperature controlled warehousing and logistics for the food industry. Corporate logistics center and winery. There is an above average availability of skilled personnel experienced in the fields needed to support distribution facilities. This availability is due to a well-established base (including many distribution centers), excellent local training facilities, the ability to draw workers from a wide surrounding area and vigorous local population growth. Washington State is an important and growing gateway for exports to the Pacific Rim, Canada and the U.S. Southeast Washington’s freight system provides competitive advantage for logistics and trade, manufacturing, agribusiness and timber/wood products sectors. Over 18 million people live within five-hundred miles of the Tri-Cities. As a result, business leaders and logistics providers choose the Tri-Cities as the ideal location for accessing the Pacific Northwest and all western states and western Canada. Logistics companies thrive here because they are close to customers, have highly skilled workers, enjoy inexpensive power and affordable land and operate in a predictable regulatory environment. An enormous variety of goods are handled on this system; food and groceries, fuel, pharmaceuticals and medical supplies, retail stock, office supplies, trash and recyclables, construction materials and equipment. Selected capital and operating costs are below those of the closest competition and significantly lower than other locations in the Pacific Northwest. Projected costs for transportation, personnel, electricity, and construction for a distribution center in the Tri-Cities are below all comparable locations in the region. The absence of corporate income and inventory taxes add to this value along with incentives for qualifying distribution centers. There also is a very competitive cost of living. The Tri-Cities are one of the few metropolitan areas on the West Coast whose average cost of living index is below the national average. Washington has no personal income tax. A study of personal taxes imposed by states and communities across the United States shows Washington locations rank among the least expensive. Job candidates are inclined to relocate when they are not burdened financially. If you are considering relocating or expanding your business, let TRIDEC help you put together the information you need. Create a personalized overview of the region. Provide data on key business factors. Evaluate the available workforce and connect you to resources that will make hiring, interviewing, screening, and training your new workforce easier. Coordinate site selection trips and customized visits. Organize strategic meetings to make your visit a one-stop collaborative effort with key business leaders, government and community officials.